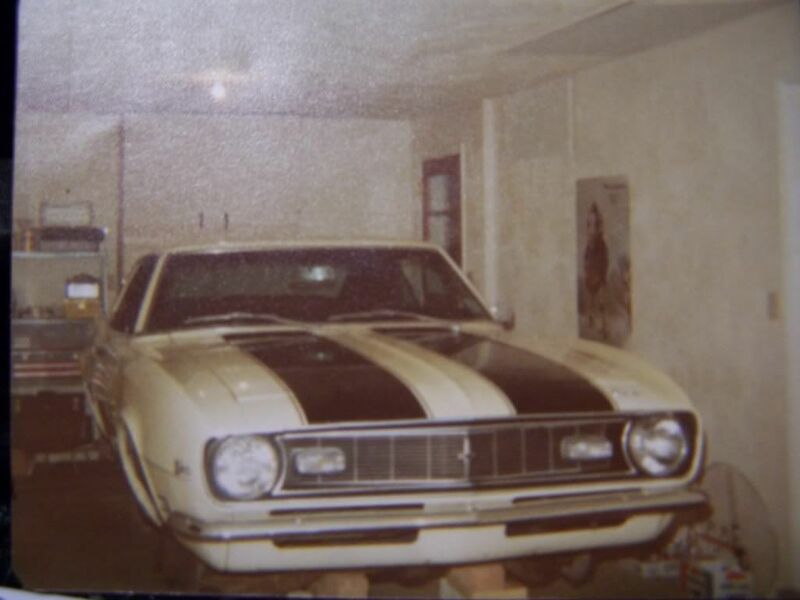 What is the correct "grey tip" oil dipstick for all 1968 Camaro small blocks? Does anyone have a picture and details on the text scribed onto the blade? Hopefully, JohnZ or one of the Legends judges can chime in. All small blocks (302, 327, and 350) used the same oil dipstick (Group 1.516, 3923239) according to my 1967-69 Camaro Master Parts Catalog No. 691A (dated July 1969). 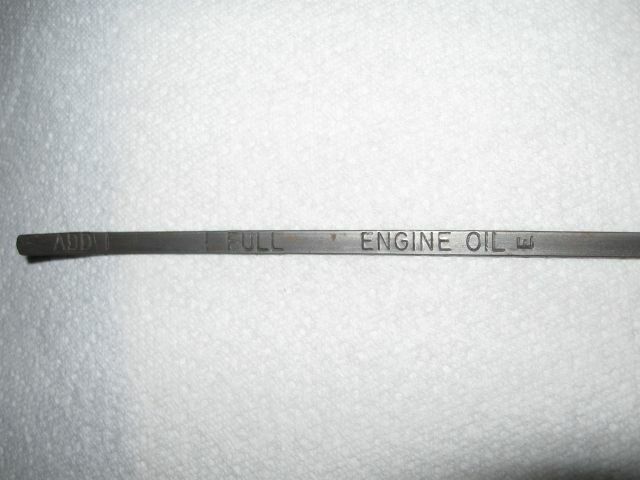 Page 6/B2 of the 1968 AIM also lists 3923239 as the dipstick for V-8 engines (pictured was a small block) and lists the dipstick as having a "grey tip". If it helps your search, according to my 1971 P&A 30A, the dimension from Full to Stop (Length A) is 17-17/32 inches and from Add to Stop (Length B) is 18-7/16 inches. Is this what you are needing? 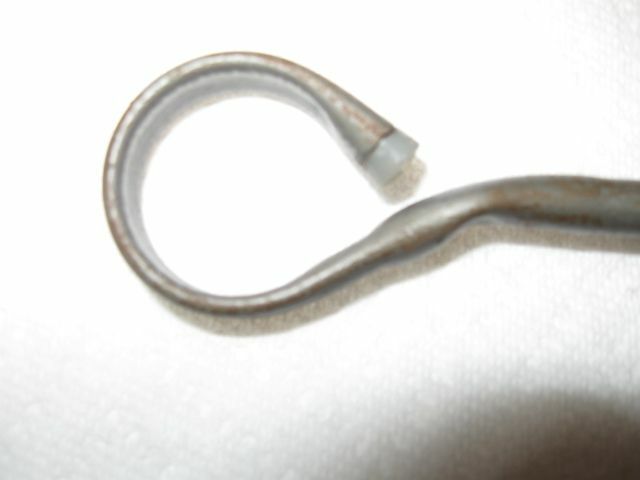 This is my dipstick from my 1968 Z28. Dimensions are the same as you are stating and the tip is grey. Is that all the text on the blade? What about further up towards the handle? I also need a picture of the handle (unpainted) with the grey tip. The CRG Forum link you gave doesn't have any pictures. That is all the text there is on the blade. I'm just guessing because I'm not sure, but I didn't think that the dimpled handle dipsticks were made until the 70s? 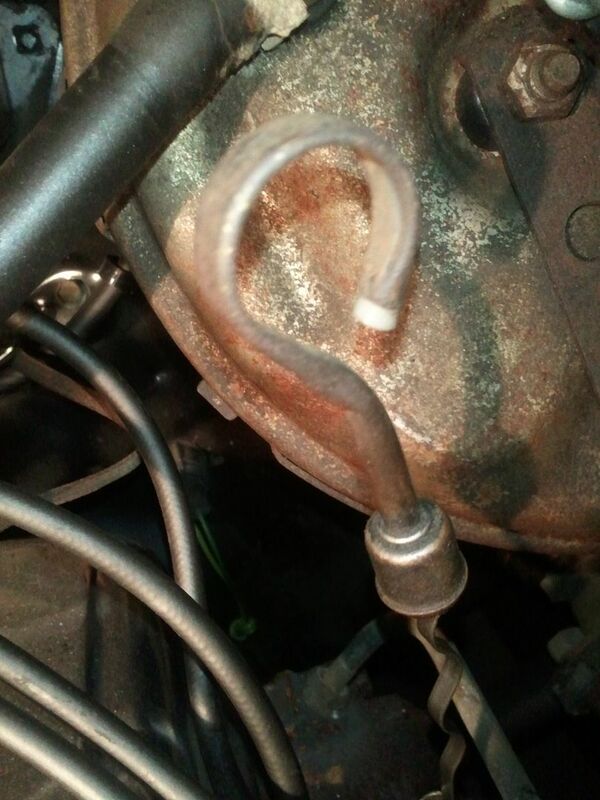 Was this your original dipstick, or a service replacement? 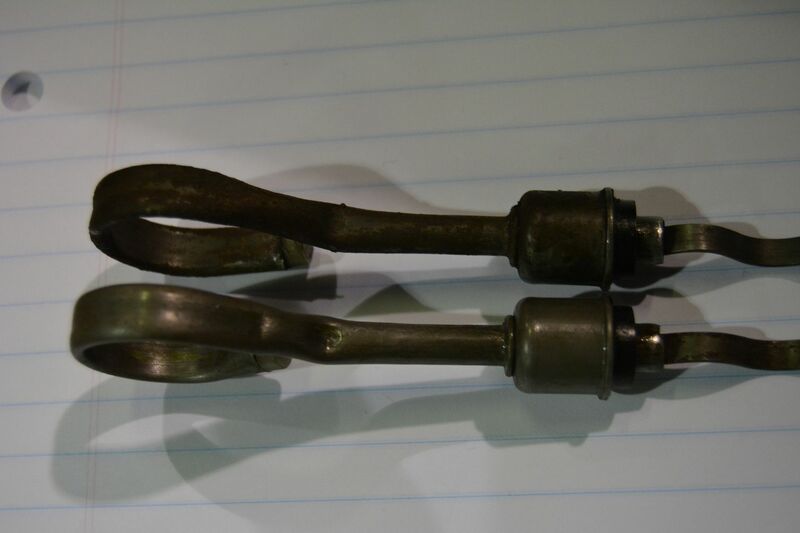 Same dipstick that was in engine when I bought the car in 1972. Original owner lives about a 1/2 mile from me and we converse often and he has stated many times that the car was completely original when he traded it away in 1972. Give Pace Car Jeff a call. He has LOTS of dip sticks and is knowledgeable about them too. I thought the dimples came later too. No problem, Bernie. Yes, you have the correct dipstick for a '68 Camaro per Jerry MacNeish. I have the same one in my '68 Z/28. The writing on the stick looks perfectly correct to me. 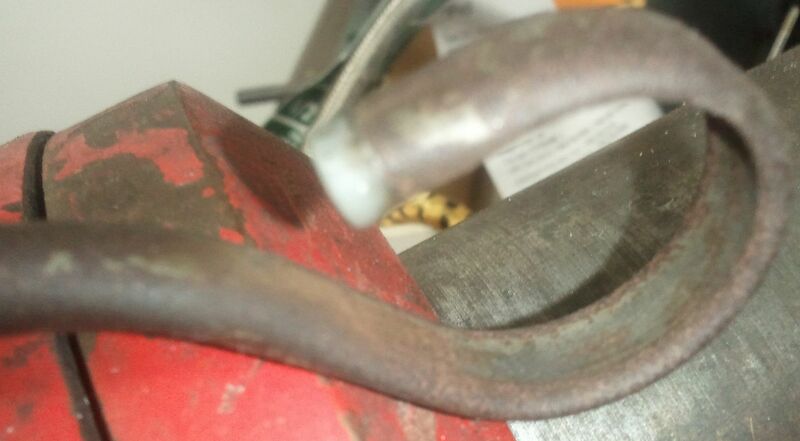 the shape of the handle is not what I typically see for 68 SB, but i would imagine that more then one or two vendors were making those at the time. I have seen a forum post somewhere, don't remember quite where, that listed the manufacture stampings....such as E, M. It didn't name the manufacture, just noted the different stampings. So I think that would account for the various differences in the handle shape. Also, being this is a late car might have something to do with the differences. I started to notice a pattern after a while - all the "M" sticks were the round handles. All the "E" sticks were the flattened curves. Those are the manufactures designation code - I would think??? I believe they were all being used interchangeably - - the wording on the sticks is what was consistent from year to year. As the GM recommended oil quality changed - so did the wording on the sticks. Dave would you mind adding a pick of yours to this thread? Dave, what stick was in that original 68Z you picked up? P.S. I brought the car home today after being garaged at my buddies house since March when I purchased it. 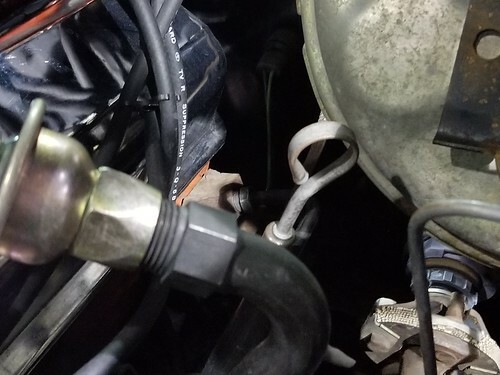 Several of us in the past have posted pictures of dipsticks from survivor cars or cars that have been owned for a long time and there has been some debate or doubt on what is considered correct in a 68 Z/28. In 2015 Danny had his 05E Butternut Yellow Z/28 at MCACN and he asked me if he could borrow a gray tipped round handled dipstick. I brought a spare I had but the main point was he had been told his was a replacement and it should be a round type. While at MCACN there was a 68 04D survivor car in barn finds. It had the exact same dipstick, thin handled gray tip with an “E” stamp. Recently with the help of several individuals I’ve put a small population together to assist with some analysis, but first a review again of the flat type handle gray tip dipstick. Pictured displayed before of the 04D & 05E 68 Z/28 dipsticks at MCACN 2015. Now Jerry’s 07C Z/28 stick which is the same as the 04D & 05E shown. And the handle of a 07D Z/28 with the same handle as the 07C, 05E, and 04D. Another needed review involved the location and similarities between the two sticks, the gray tipped round handle vs. the flat handled gray tipped stick. Here is our round handle! Now putting our round handle gray tipped stick beside the 07D flat handled gray tipped stick the location of the ADD and FULL marks are in the same location as the round handle stick. Note the difference in “E” stamp and “M” stamp. Granted this is a small population but interesting and I’m confident there were two sticks used. Here is a chart of what we have so far but looking to add more 67 & 68 examples. Paul, can you confirm what stamp is on your 02C LOS Z/28 stick? All of the above have the round handle with gray tip. All five of these NOR Z/28’s have the same flat handle gray tip “E” stamped stick and all of them are survivors. Chances of all 5 of these having service replacement sticks is extremely unlikely IMHO. Plus there is no part # on stick similar to other service replacements or pierced area like later service replacements. Paul, can you confirm what stamp is on your 02C LOS Z/28 stick? Sure can, Chick. I posted the information HERE back in 2008. Didn't we have a similar discussion a couple of years ago (re 1969 dipsticks), and discovered the same (or very similar thing).. ie. a change within the year, or multiple suppliers?? Yes, there is a flat handled 69 and round handled but some have stated it has to be a flat handle type. 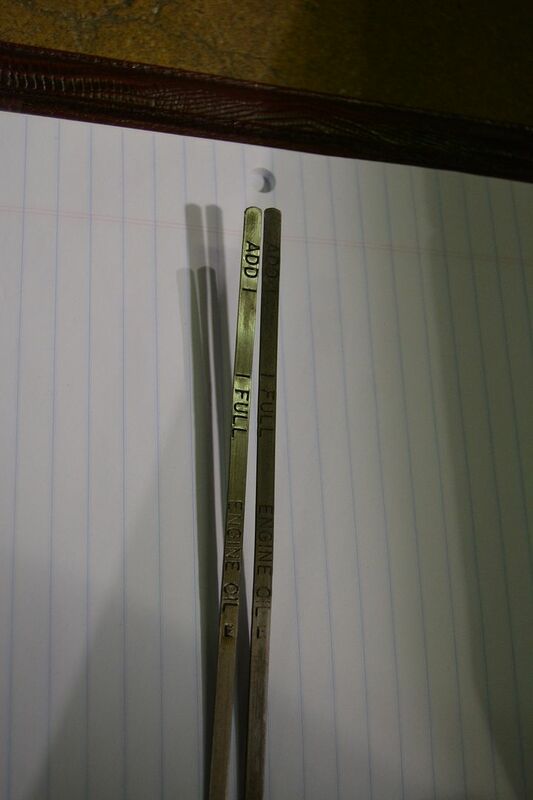 This picture is the same two sticks but more clearly shows the stampings, i.e. the "E" stamp and "M" stamp. "My '68 Z dipstick is different than the one in your photos. It does have the rounded handle like yours, but there is no indentation on the handle where the gauge is pinched into the handle. Mine has a gray plastic tip in it. There is no part number stamped into mine." "Here's what is stamped on my gauge: ADD : : FULL ENGINE OIL M"
Paul is referring to Jerry's 68 07C flat handle with gray tip . 06b flat handle e stamp gray tip 327 /2bbl original owner car. Motor has never been out off car since left Norwood. Just added another one as John's 12D 68Z has a flat handle gray tip dipstick. I think all the flat handled grey tip dipsticks are incorrect and probably not worth even scrap so you should all just send them to me and I'll take care of them. Actually, I just wonder if there's is any concept of NOR vs. LOS. I have a grey tipped round handle but it's not original to mine as I purchased it from Jeff. I really can't believe all those flat handle sticks could be wrong. I'm with Jeff even though I do have a dog in the fight, that there had to be more than one supplier and with the length and levels the same, it fills the requirement GM probably needed. 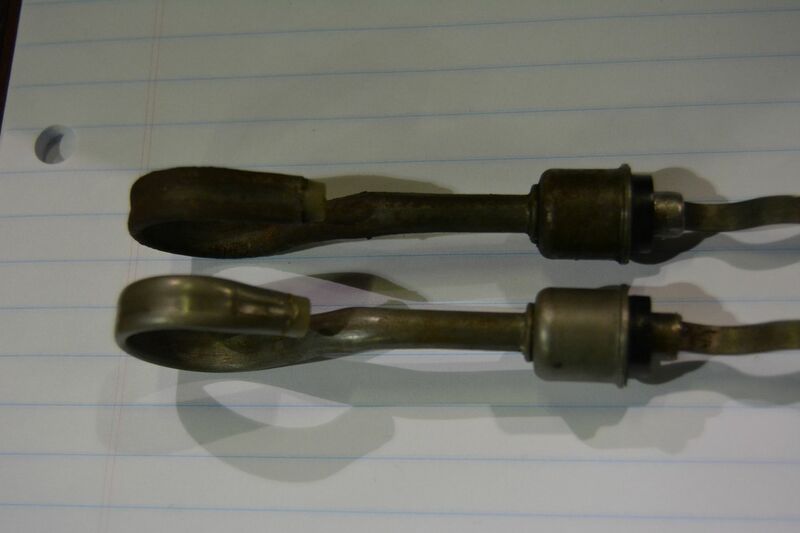 I agree that there were probably two suppliers and thus two types of original 68 gray tip dipsticks.